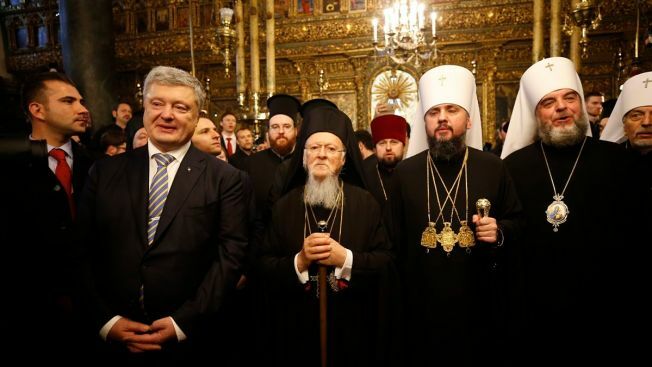 Ecumenical Patriarch Bartholomew I, center, Ukrainian President Petro Poroshenko, second left, and Metropolitan Epiphanius, the head of the independent Ukrainian Orthodox Church, third right, pose for a photo during their meeting to sign "Tomos" decree of autocephaly for Ukrainian church at the Patriarchal Church of St. George in Istanbul, Saturday, Jan. 5, 2019. The Ecumenical Patriarch of Constantinople has signed a decree of independence for the Orthodox Church of Ukraine. Bartholomew I's decision in October to grant the Ukrainian church "autocephaly," or independence, infuriated Moscow and the Russian church severed ties with Istanbul, the center of the Orthodox world. Kiev has been pushing for a church free from Moscow's influence, which intensified after Russia's 2014 annexation of Crimea and amid the ongoing conflict in eastern Ukraine.